There's a book called Skinny blank (rhymes with witch but starts with a B) and the other day, I was in a maternity store with my mum when I saw another version of the book, titled Skinny Witch (with a B): Bun in the Oven. I couldn't figure out what was worse - the fact that the book (I have the first and it's so stupid... they convince you to basically become a Vegan, encourage you to work out (duh), remind you that fruits and vegetables are good for you (double duh), and tell you that pooping is a good thing - wow, all things I never knew!!! *sarcasm) was in existence or that I actually chose to waste 5 minutes of my life skimming through it. Probably the latter... but anyhow, as I scanned its contents, the only thing I could think of was, do people really buy into this? The two women who wrote the book are both very skinny indeed, but their poor lives are minimized to eating Vegan (which I love by choice, but not all the time.... I'm all for a veggie sandwich every now and then but I still love a medium rare steak cooked to perfection!) and they probably go to sleep a bit hungry every night just so they can keep their too skinny bodies in shape to sell their books. We have to be careful what we read or what we see portrayed by the media. They are all out to market, market, market, because ultimately they want to sell, sell, sell!!! You can still trust some of what you hear (a salad with creamy dressing and fried chicken is not healthier than some chicken and rice, croutons are not making your salad healthier, portion control is important considering America's decline to HUGE DOUBLE, TRIPLE sized portions!) but all of it will be logical. Yes, eating a homemade hamburger is healthier than eating one from Red Robin, because they indeed slather butter on the buns, the meat, and probably the veggies that go with it (that's why it's so dang good!). Yes, eating a homemade smoothie is less sugar than one from Jamba Juice (who uses sorbet in almost all their drinks and also add sugar on top of the natural sugars found in the blended frozen fruit). These all make sense right? But telling your body no more carbs so you can lose weight? ERROR. Telling your body to cleanse itself with lemon juice, cayenne pepper and some sort of water mix? FAIL! Be healthy folks. Eat a balanced meal full of whole grains, veggies, protein, fruit, dairy and make exercise a part of your daily routine. No time to work out? Fine, take the stairs! No time on the weekend? Do something active with your family and friends! There's this thing called the park, I hear it's free and has lots of places to walk around, play tennis, sometimes handball and even basketball! Oh, and try to limit your sugar intake. Desserts are indeed fun and pretty, but they are dangerously high in calories and bad fats that are harder to burn. If you are accustomed to having dessert every night, try mixing in some fruity desserts and slowly weening yourself away from a chocolate cake, cheeseecake or cookie and soon, you may finding yourself just wanting some apples, watermelon or pineapple (also sugary but better). 2) Add mo' onions and some black beans - normally, I'd use 1/4 cup of onions with 3 pounds of beef... but really, that's just to flavor it but by adding more, you are changing up the mixture to be a little more veggie infused while the beans just add protein (you get full quicker) and are fiberliciously tootful and whatever else you do afterwards! 4) add a boiled egg - talk about your protein fix! I had three freshly boiled eggs to add to the salad but the husband decided to slice it up and add it to his Sloppy Joe. Great idea! For an EVEN healthier kick, take out the yolk and egg whites only! 5) Anytime you decide to go healthier, make sure the flavor is not gone. We've decided to add some cayenne pepper to our mix to give it a kick! Cook ground beef in a medium skillet on medium until brown, add onions and cook until tender. After mixing sauces, add in about 1/2 a can of black beans. Reduce heat to low and let simmer for 30 minutes while you go make a healthy side salad. Toast dem wheat buns right before serving, add a little bit of cheese if you prefer before tossing on the hot Sloppy Joe mix! Serve with salad. I've been more consistent with my workouts and boy, can I feel the difference. I'm more upbeat, energetic, and I can't wait for the next endorphin pumping session. I've been able to make time for working out by leaving work at 5 PM for the past two days (miracle in itself!) which gives me a decent half hour and still time to make dinner and enjoy it with the husband. It really does take a push to get into the initial mode of things. At first, exercise is bleh. I didn't really exercise via gym until post college (growing up, there was always the dance team and classes and then in college, there was the ballroom dance team). On another note, I've decided to review all my ballroom knowledge. Having actually gotten to gold level in standard and silver in latin, I know enough to teach friends the basics so I should ensure I have the information to share. It's all about sharing and collaborating and though I can do it myself, it seems useless if I can't share. Maybe I can even get a gig teaching at Arthur Murray? I love Martha Stewart! Her stuff is just GOLDEN! Her wedding website was awesome and as a result, I not only got a sweet seating chart scaled to size that I inputted, but following the big day, I wrote a couple reviews for my vendors and now get a free Food Magazine by Martha Stewart that has TONS of awesome recipes! 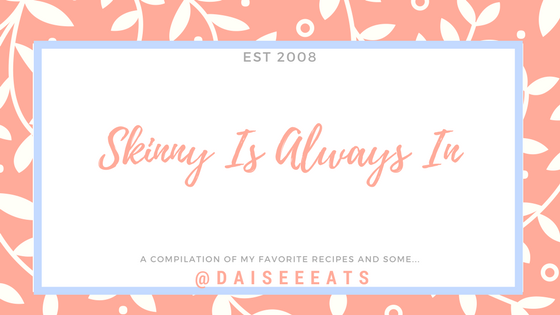 I am only beginning my adventure with her magazine but man, do I love having a photo and easy recipes that don't take longer than 1 hour and normally consist of items I already have in my kitchen! Tonight, I made "spice-rubbed fish with lemony rice," with a substitution of cucumber for zucchini (because that's what Andy got for me but in reality, it's like he knew because I prefer cucumbers!). Any extra spice can be sealed and stored up to 3 months. I put what we had left in a ziploc bag and I think it will probably make one more fish but only time shall tell. So, first you chop up the onion, get your garlic ready, zest your lemon and cut it in half, and slice up your cucumber. Next, in a medium saucepan, heat the butter on medium and then add the onion and garlic for about 4 minutes or until the onion is soft. Next, stir in the rice and cook for 1 minute. Now, stir in the lemon zest, squeeze half a lemon, the cucumber slices and season with some salt and pepper (I used kosher salt and ground pepper). Bring the mix to a boil and then let it simmer for about 13 minutes. While you wait, wash the dishes you already used, fold some laundry (all things I did) and get the fish ready by putting the spice mix on one side. 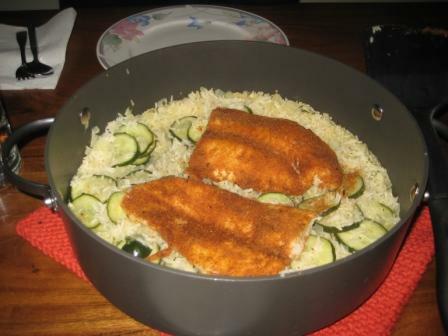 Next, put the fish on top of the rice with the spice side up and cover the saucepan for about 7 minutes (fish cooks fast!). Wa-la! Dinner is served!!!!! The recipe is supposed to make 4 servings but between Andy and me, we about 1/3 cup of rice left with a tiny piece of fish left (think one tim tam). Not sure what that means but it was delicious and we got our vegetables, grains (sorta) and protein! celery is supposed to be a zero calorie food item so I guess celery with peanut butter is just eating peanut butter but exercising your mouth while doing so. Need some more variety? Put some raisins on top of the peanut butter.